In honor of the launch of Tao of Stoke we’re sharing our insider’s guide to one of the world’s best places to surf: Bali. The island of Bali embodies what the Tao of Stoke is all about. It’s a tropical paradise, populated by friendly, spiritual, and present Hindu locals who believe in karma and reincarnation. Compared to other Indonesian islands, Bali is relatively safe as long as you stay off the scooters. Most importantly, the surf is epic. Today we are sharing how you could spend 30 days in Bali. To stay more than 30 days in Indonesia, US citizens have to get a visa. If you really want to stay for more than 30 days, you can pick up a 30 day visa upon arrival. You are allowed to extend a visa one time, so toward the end of your first 30 days simply extend it. Done. Another option is to explore a nearby eastern Asian country for a few days and then return to Bali. This resets the clock and gives you another 30 days. For example, Singapore is worth a visit and Taiwan has some beautiful scenery and killer waves. A couple popular flight routes from the States will take you through Taiwan, Singapore, or Hong Kong. If you want to save a few bucks check out one of the local Asian budget carriers to Bali. Jetstar, for example, is owned by Australian airline, Quantas. They run solid deals to and from Singapore and Australia. We dig EVA Air, which connects through Taipei to Denpasar (and gives you a good excuse to explore Taiwan). Don’t let the price tag fool you -- the price to get to Bali may be hefty, but once you’re there get ready to live like a king (or queen) for less than $100 a day. Dinner-for-two at a mid-range restaurant can cost less than $20 and some hostels charge as little as $7. With prices like this, you may never want to leave. Denpasar is great to fly into, but we don’t suggest hanging around too long. It’s overcrowded and difficult to navigate. You’ll see families of six, balancing on a single scooter, weaving in between traffic. Unlike in the US, lanes aren’t really acknowledged in Bali. Cars and scooters crowd the road and make it dangerous for tourists new to the area to maneuver. No thanks. Our advice? Hire a driver. In Bali, they’re an affordable option that keeps you from having to deal with the possibility of getting in an accident. For the best driver from the airport and in and around Ubud, contact Astawa. He’s the man and can take you anywhere you need to go. It’s about 20 miles from the airport to Ubud. The trip will take roughly an hour and a half and cost around $20. Hit up Ubud, the spiritual heart of Bali. The popular memoir novel, Eat. Pray. Love., made this a popular destination. 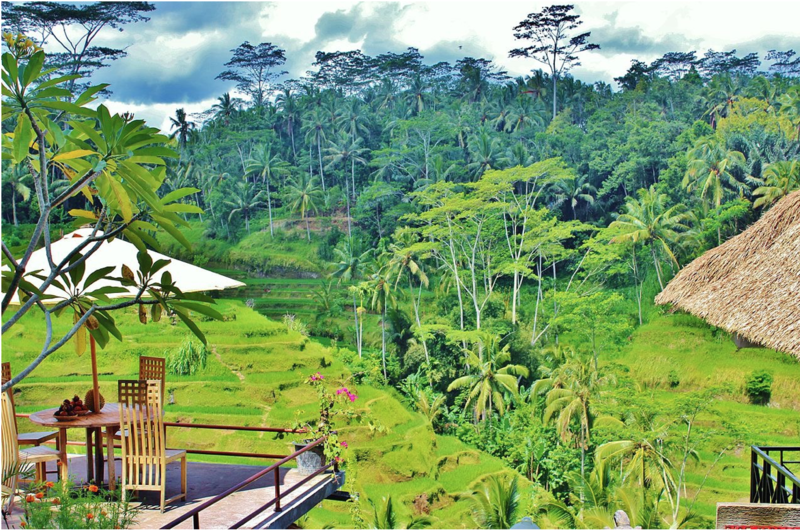 Yogis will be in heaven -- Ubud is definitely worth checking out for a couple of weeks. Hostels are a great choice if you are on a budget, and like with everything in Bali, rooms are much cheaper than they are in the states. 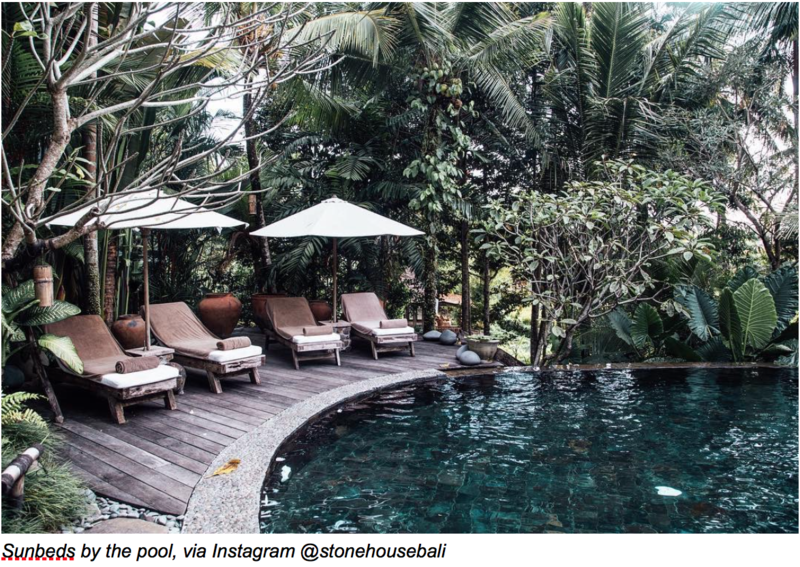 Splurge (in relative terms) on a stay at Stone House Bali. The Java Suite for $195 per night is one of the nicest places you’ll ever stay. Breakfast is amazing and the pool is hard to leave. Better yet, owners Walker and Wendy are super cool people. Airbnb has a ton of great options if you would rather opt for a villa-style accomodation. 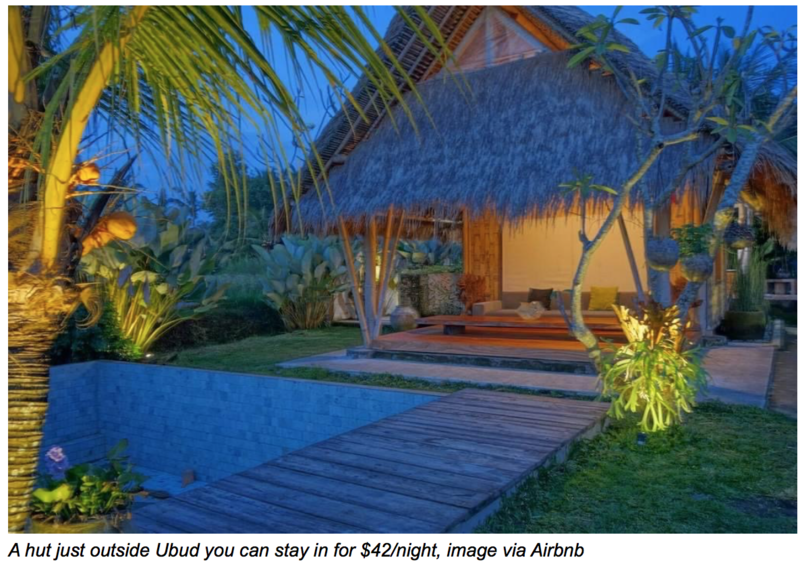 In the heart of Ubud, this entire villa with a private pool will only cost you $72 per night. Looking for something more secluded? Take a look at this dome for $79 a night, or a hut for $42 per night.